Earlier this week, I talked a bit about the Embassy Suites Make a Difference Training Camp, held at the Pointe Hilton–Tapatio Cliffs Resort. In retrospect, it was a very special event that touched many attendees' hearts. Main sessions included a brand update, along with discussions on mentoring and customer resource management tools. Breakout sessions delved into the ways each attendee could make a difference at their property by how they interacted with and treated their coworkers and guests. These were built around five themes: building trust, respect and confidence with each other; connecting with each other; making an impact; using your intuition; and using your style. Tamara Acuna, breakfast ambassador, Embassy Suites Miami–International Airport, was inspired by the program and looked forward to spreading the spirit of the event at her hotel. Organizers also had a special surprise in store for the attendees. As part of a team-building exercise, the teams each broke into three sub-teams and were given bicycles to construct. Unbeknownst to the teams, more than 50 underprivileged schoolchildren from the Phoenix area were waiting in a nearby ballroom. 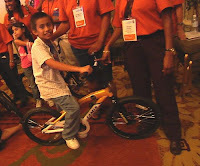 After the bikes were completed, the children were brought in to see their new gifts. Jenay Peters, sales associate at the Embassy Suites Milpitas-Silicon Valley, felt grateful to be a part of the whole process. Peter's fellow teammate from Milpitas-Silicon Valley, Porsché R. Green, also weighed in. "Though it was training, I felt that it was a great opportunity to bond with fellow Embassy Suites employees and receive feedback on how each property works. I will forever remember the people that I met, and the joy that we all brought to the children from the Boys & Girls Club. That day touched my heart the most and brought us all close together." My co-workers attended Make a Difference and let me tell you they are Fired Up. We viewed the DVD and I was very touched with everything that went on over there. I am going to use this everyday of my life not just at work but on a personal level. I am the President of C.A.R.E. (Caring, Attentive, Responsive, Empowered) here at the Embassy Suites La Quinta - Hotel & Spa and with my co-workers being part of the Committe. WE ARE GOING TO MAKE A DIFFERENCE. This event has sure made a Difference in alot of peoples' life. THANK YOU!!! Thanks so much, Alejandra. I'm so glad that your co-workers and the program have had such a positive impact on you!